Broadly speaking, dilution refers to making a colour lighter – like mixing a coloured paint with white paint. The colour of cat fur is due to the size, shape and distribution of the melanin (black pigment) or phaeomelanin (red pigment) granules in the hair. The hair has a central shaft (cortex) and outer sheath (medulla). Melanin granules may be distributed differently in cortex and medulla. Granules in the medulla can be a different size and orientation to those in the cortex. It is the combination of location, size, shape and density of melanin granules that gives different colours. 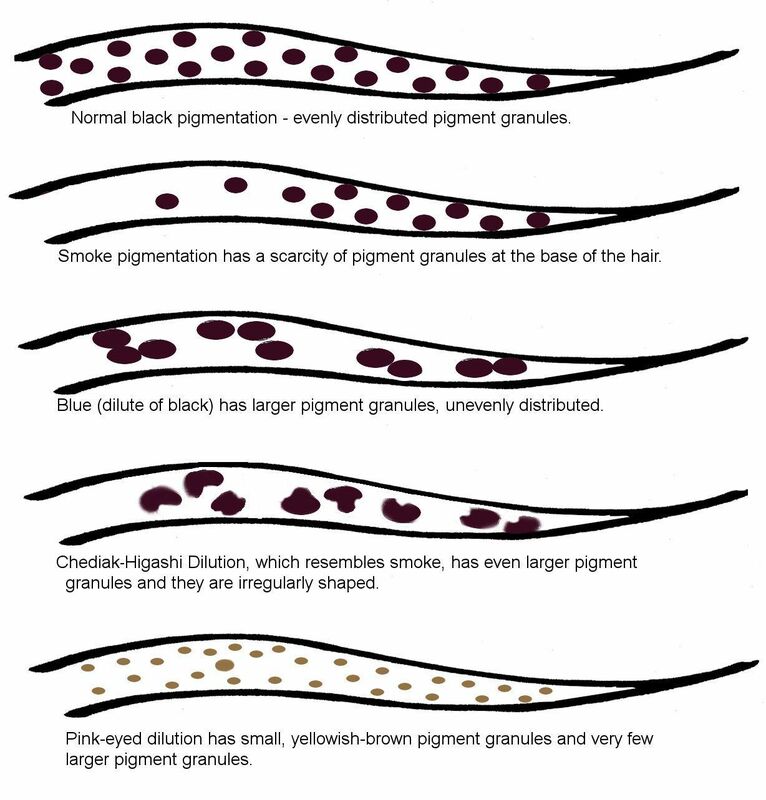 Prieur & Collier (1981) compared the melanin granules in hair of black, smoke, blue, Chediak-Higashi-smoke, and pink-eyed dilution cats. A portion of the preserved skin of the pink-eyed dilute cat was used in this study. Black cat hair (non-agouti) contains numerous small dark brown to black melanin granules uniformly distributed throughout all portions from base to tip of the hair. Smoke cat hair (non-agouti + inhibitor (silver) gene) has a scarcity of melanin granules at the base of the hair. Blue cat hair (non-agouti + dilution) has larger basic melanin granules, but still relatively regularly shaped, and a non-uniform distribution of granules. Chediak-Higashi Smoke cat hair trait has even larger melanin granules than the blue dilution, and they are relatively irregularly shaped. All of the cats were Persian and resembled blue smoke Persians. The pink-eyed dilute cat hair had very small yellowish-brown melanin granules and very few larger granules. Under the microscope, some lighter banding could be seen on the hairs, but the tip was coloured. The base of the hair was paler than the tip (agouti banding). - Prieur DJ, Collier LL. 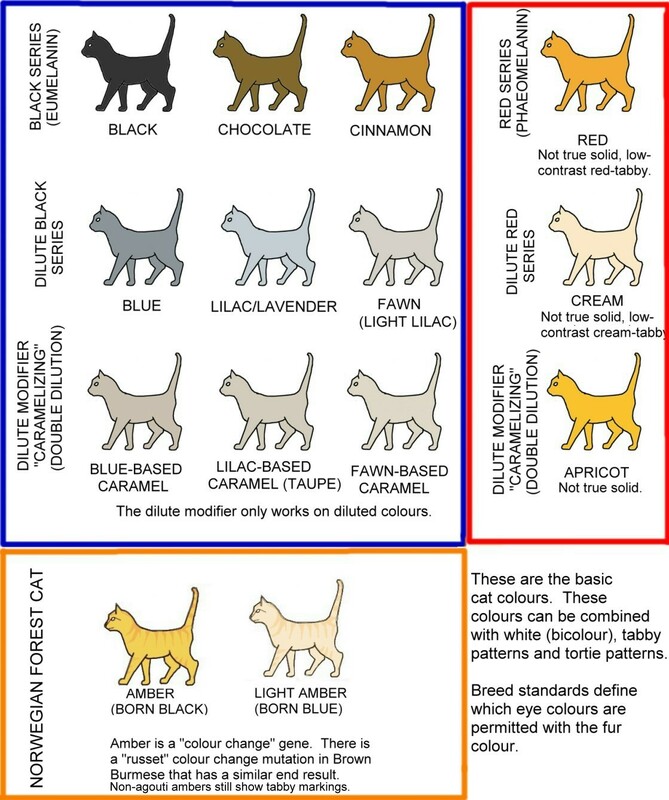 Morphologic basis of inherited coat-color dilutions of cats. J Hered. 1981 May-Jun;72(3):178-82. The normal dilution seen in cats is "blue dilution" that changes black to grey (blue), chocolate to lilac, and cinnamon to fawn. Blue dilution affects the skin and coat colour by altering the pigmentation granules, but leaves the eyes pigmented. Prieur DJ, Collier LL. Maltese dilution of domestic cats. A generalized cutaneous albinism lacking ocular involvement. J Hered. 1984 Jan-Feb;75(1):41-4. "The Maltese dilution is an autosomal recessive trait of cats that dilutes black cats to blue, and orange cats to cream. The pigmented cutaneous and ocular tissues of Maltese dilution and control cats were examined and compared by light microscopy. Most of the melanin granules in all of the pigmented cutaneous tissues of the Maltese dilution cats were aggregated together into large clumps. However, none of the intraocular tissues containing melanin producing cells of either neural crest or optic cup embryologic origin contained clumped melanin granules. It is concluded that the Maltese dilution trait is a unique generalized albinism without ocular involvement." Pink-eyed dilution is found in a number of mammals but there is only one good account of it in cats. It changed black to a fawn/bluish-tan colour and the eyes had a red pupil and gold flecked red/pink irides (the coloured section around the pupil). There may have been occasions where pink-eyed dilution has been confused with pink-eyed albino which is reported sporadically in cats. Analysis of hairs from the preserved skin of the female pink-eyed dilute showed very small yellowish-brown melanin granules and very few larger granules. The base of the hair was paler than the tip and some hairs had lighter banding (agouti banding) that was only visible under magnification. The tip of the hair was coloured. For those with a scientific background, I’ve included details from the two known studies of the single confirmed cat with this mutation. To untangle the different pink-eyed mutations, here is a short description of the albino series in cats showing where pink-eyed albino fits in. It is the most recessive of the albino alleles (gene variants). A pink-eyed albino has an unpigmented white coat. A pink-eyed dilute has a coloured coat (right now we don’t know how pink-eyed dilution interacts with dominant white (white masking)). Temperature-sensitive albinism in cats is caused by tyrosinase (TYR) mutations. For the molecular genetically minded, it is a cytosine deletion in the TYR gene. Cat fanciers refer to it as the "C" locus (a sort of genetic "address"). Albino cats have been reported in scientific literature (Todd 1951; Turner et al. 1981) but their eye-colour has not always been well described. Blue-eyed albinos have not been properly distinguished from pink-eyed albino cats (Bamber & Herdman 1931; Todd 1951; Leventhal 1982; Leventhal et al. 1985). This made it unclear as to whether there were more than "one non temperature-sensitive albinism alleles" in cats i.e. both blue-eyed and pink-eyed. Lyons believed the single report of a red-eyed albino cat to be erroneous (Imes et al. 2005), but since 2005 there have been more reports and photographs of pink-eyed albino cats (this mutation has entered the Bengal breed via the Asian Leopard Cat). Because of the cat's eye structure, pink-eyed albinos often appear lilac-eyed with a red pupil, however the coat is always white. Blue-eyed albinos have pale blue irides and must not be confused with "blue-eyed white" cats that have the white masking gene and vivid blue eyes. It was the author's original intention to report in detail on the genetic basis, if any, for the cat to be described below. However, her untimely death due to an intestinal obstruction ended the work almost before it was started. During the summer of 1958 three kittens from a litter were turned over to the SPCA in Springfield, Massachusetts. Their estimated date of birth was April 1958. Two of these animals were apparently quite ordinary, although not detailed description of them was available. The mother was presumably normal; the father was unknown. The third kitten, a female, had pink eyes (although a small amount of yellow pigment was present in the iris) and a light tan coat. She was a blotched tabby (dominant) with moderate white spotting (dominant) and had a slight kink at the tip of her tail. Her hair was short and dense with a fine texture. In all other respects she conformed to the wild type. It is suspected that she had some visual impairment from the rather clumsy way she would run into things and from her hesitancy to jump from a height which would not disturb most cats. The cross produced a litter of three kittens, born 10 days prematurely with the result that none survived. However, all were fully pigmented tabbies and therefore of the genotype +acb+bb+aa. From the data it can be concluded that the phenotype of the mother was due (if indeed genetically determined) to the homozygous recessive condition at some locus other than that of the albino series of the black-brown alternatives. The following comes from my translation of “Zur Rassebildung und Rassezüchtung der Hauskatze” (On Racial Constitution and Breeding Of The Housecat) by Dr Friedrich Schwangart (Dresden), 1932. This book has not been translated into English until 2018, so this description of a pink-eyed dilute (30 year's before Todd's specimen) has previously been overlooked. In addition to normal dilution, Schwangart’s interpretation of cat colours included leucism (white fur on pigmented skin), albinism (white fur on unpigmented skin) and flavism (dilution of any colour to cream). It is only with hindsight that we can identify this as pink-eyed dilution. In Chapter V, “Colouring (of Hair, Skin, Eyes Etc. )” Schwangart writes: “As already mentioned, the characteristics of full-scale albinos include not only a completely pigment-free (white, pink) skin, but also eyes with a red-looking iris and an equally bright pupil. This scenario is exceptionally rare in the domestic cat. [. . .] I know of pigment-poor tints: a blue iris with a normal dark pupil where the pupil shines red, a case of a pale lemon-yellow iris with an intensely red shining pupil [. . .]"
Albino Result: N/N - No copies of albino allele are present. Amber Result: E/E - No copies of the mutation for Amber. Brown Result: B/B - Full color black, does not carry brown or cinnamon. Colourpoint Result: C/C - Full colour, cat does not carry Burmese or Siamese alleles. Dilute Result: D/D - Full (Dense) color. Cat does not have the dilute allele. Milkdud's skin was closer to a fawn colour and his eyes had yellow irides with red pupils. There is no genetic test for pink-eyed dilution. Photos exist of the original pink-eyed dilutes hairs under high magnification, so that is one route to investigate (the Don Sphynx has slight furring on the tail). The other is to breed furred cats with the same colour and eye colout and to analyse their fur. While the genetic basis isn't yet known, visually Milkdud appears to be a pink-eyed dilute and hence a new opportunity for the cat fancy. 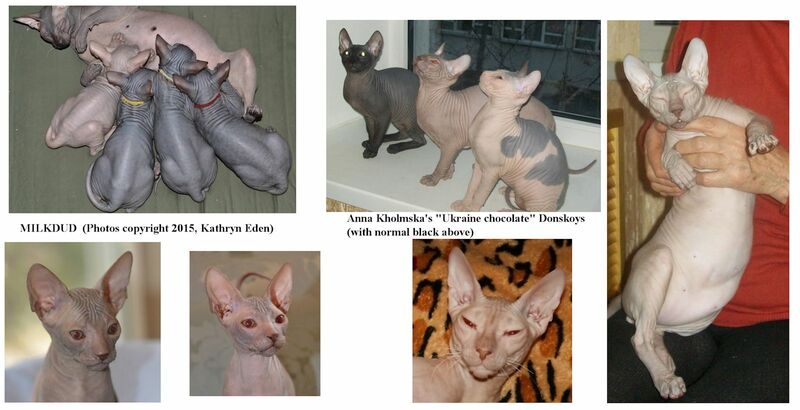 Anna Kholmska, in Ukraine, has bred 4 generations of these cats (over 7 years) to establish a breeding line. All have been healthy. The unidentified colour is known in discussion (during 2015) as "Ukraine chocolate." From the visual appearance, it closely resembles the description of pink-eyed dilution. What is exciting, is the possibility of a lost phenotype reappearing in cats. The colour also needs to be bred into furred cats for study. Anna notes that the chocolate colour (b at the TYRP1 (B) locus) is not accepted in the Donskoy, although it can be very attractive. For more than seven years, Donskoy Discovery has bred show-quality cats, including some that resembled chocolate colour. Unlike Chocolate Orientals, the Donskoys had an unusual eye colour that appeared pink in some lighting conditions. This was initially attributed to a combination of the chocolate gene with the dominant hairless gene, but the work of Kathryn Eden and Anna Kholmska and genetic testing has shown that the chocolate allele is absent. The cats need to be tested to confirm the presence of the dominant B allele (black). The coat and eye colour could be caused by a novel dilution of black (if B is present) or by some other mutation (if B is absent). All of the cats share a common ancestor. Their genotype (genetic makeup) shows they should be solid black but their phenotype (visual appearance) is chocolate. This indicates a diluted-colour but the cats do not have the dilution gene (d/d) at the D locus. In any case, “d” causes blue dilution i.e. black to grey. “d” is one of the three genes involved in melanosome transfer and translocation. The unexplained “Ukraine chocolate” seems due to a gene for which there is no test (at least in the cat). Possible candidates are the other two melanosome transfer and translocation genes: Myosin Va (MYO5A) and RAB27A. Genes involved in the synthesis of eumelanin other than TYRP1, for example, TYRP2, are also possibilities. The other known dilutions in the cat are the extinct Barrington Brown cats (none of which were bred outside of a laboratory colony) and the single example of a pink-eyed dilution cat. The genetic basis for the “pink-eyed” /”Ukraine chocolate” Donskoy kittens is being researched by Marie Abitbol, DVM, PhD, HDR, Lyon School of Veterinary Medicine, France. The parents of the pink-eyed cats are both black cats. The first results were released by Dr Marie Abitbol in February 2016. She received hairs from 5 Donskoy cats: 2 pink-eyed cats (unverified-color), one black self-colored cat, a brown tabby cat and a red cat. She also compared a reference sample from a Chartreux cat, because this blue breed is homozygous for dilute (d/d for the D locus, MLPH gene and mutation). The hairs from the black cat were uniformly and deeply pigmented with a dark-brown to black color. The hairs from the brown tabby cat were deeply pigmented with a dark-brown colour. In some hairs we noticed a light-gold band as expected for agouti hairs from a tabby cat. The hairs from the first pink-eyed cat were uniformly pigmented with a light-brown color. Hairs from the second pink-eyed cat included uniformly pigmented hairs and hairs with a light-gold band, both on a light-brown background. Dr Abitbol assumed that the second pink- eyed cat is genetically a tabby cat with agouti banded-hairs. Melanin granules from the pink-eyed cats were lighter in colour than the brown granules observed in the brown tabby cat and the dark-brown granules observed in the black cat. It was not possible to measure the number or size of the granules, but it seemed that pink-eyed cats had less deeply pigmented granules than the black cat. The melanin granules appeared identical in shape between pink-eyed cats and the black cat. No enlarged granules, as found in the diluted (blue) cat, were found. The distribution of the melanin granules was regular along the hair of the self- coloured pink-eyed cat, which is the same distribution found in the self-colored black cat. In contrast, in the diluted (blue) cat, the melanin granules are clustered and unevenly distributed along the hairs. This indicates that the colour phenotype observed in the two pink-eyed Donskoy cats is a modification of the dark pigment (eumelanin). Breeders of “pink-eyed” Donskoy cats described it as a recessive mutation. Genealogical (pedigree) data confirms it to be an autosomal recessive (not gender-linked). A “pink-eyed” cat carries two copies of the mutation involved in the “pink-eye” phenotype. A carrier cat has only one copy of the mutation and is “normal-eyed”. A non-carrier cat has no copy of the mutation and is normal-eyed. This means 2 pink-eyed cats bred together will produce only “pink-eyed” offspring. A pink-eyed cat mated to a carrier will produce both “pink-eyed” and carrier offspring. Two carriers of the mutation, can produce a mix of normal-eyed, pink-eyed and carrier offspring. This indicates that the pink-eye phenotype is caused by a single gene. DNA from cheek swabs from pink-eyed cats are being analysed by Dr Abitbol. Because the Donskoy “pink-eye” phenotype resembles the pink-eye mouse and non-syndromic oculocutaneous albinism (OCA) in humans, these sequences were investigated in the cats’ DNA samples. Dr Abitbol analysed the DNA from one pink-eyed cat, for 8 genes involved in OCA (which includes the gene that produces the pink-eye mutation in the mouse). There were several variations in the DNA sequence from the pink-eye cat when compared to the reference sequence of a fully pigmented cat. In the pink-eyed cat, one of these variations was present in two copies, which concurs with a recessive mutation. However, two other pink-eyed cats had only one copy of this variation which rules out this mutation as the cause of the pink-eye phenotype. While the phenotype of the pink-eye cats resembles the pink-eyed mouse and OCA human, a different gene appears to be responsible for the pink-eyed Donskoy cats. The mutation may lie in a non-coding region from one of the 8 candidate genes or in a completely different gene. This necessitates a “genome wide” approach to compare DNA from multiple pink-eyed Donskoy cats, and from normal-eyed Donskoy cats, including relatives of the pink-eyed cats and unrelated cats. Dr Abitbol will apply for a research grant later in 2016 to fund this. In the meantime, further DNA samples are being collected for analysis. Bamber, Ruth C. (Mrs Bisbee) & Herdman, E. Catherine, "Two New Colour-types In Cats." Nature Vol. 127, Issue 3206, 11 April 1931, p558 "Zoology Department, University of Liverpool, Mar. 13. DURING the past year, we have obtained two cats, each of which is apparently a new colour-type. The first seems to be an albino. He was exhibited at a cat show in Paris in 1930 and came into our possession shortly afterwards." Leventhal AG. Morphology and distribution of retinal ganglion cells projecting to different layers of the dorsal lateral geniculate nucleus in normal and Siamese cats." Journal of Neuroscience. 1982;2:1024–42. Leventhal AG, Vitek DJ, Creel DJ. "Abnormal visual pathways in normally pigmented cats that are heterozygous for albinism." Science. 1985;229:1395–7. Lyons LA, Imes DL, Rah HC, Grahn RA. "Tyrosinase mutations associated with Siamese and Burmese patterns in the domestic cat (Felis catus)." Animal Genetics. 2005;36:119–26. Robinson R. Genetics for Cat Breeders. Oxford: Pergamon Press; 1991. pp. 113–4. Turner P, Robinson R, Dyte CE. Blue eyed albino – a new albino allele in the domestic cat. Genetica. 1981;56:71–3. Todd NB. A pink eyed dilution in the cat. Journal of Heredity. 1961;52:202.